I'll Be There by Holly Goldberg Sloan. Grades 7+ Little, Brown Books for Young Readers, May 2011. 400 pages. Reviewed from ARC provided by publisher. Sam hasn't been to school since the second grade when his schizophrenic father took him and his younger brother Riddle and went on the lam. Since then, they've moved every time his father starts getting paranoid, and Sam and Riddle are on their own for pretty much everything. Our story starts when Sam walks into a church and hears a girl (Emily) singing a solo he's sure is meant just for him. And everything begins to change. The brilliant storytelling drew me into this book and didn't let me go until the last page. There's a little something for everyone here - contemporary, adventure, thriller, romance - and it's told in a way that feels somehow classic. Maybe it's the third-person omniscient narration? You get the story from everyone's point of view and it turns this tale of two lost boys into the story of an entire community. I also think this is a book that is equally appealing to boys and girls. Yes, there's some romance, but it's nothing graphic or overdone, and there's a large element of adventure and survival. ALSO, I think this is a GREAT crossover title and it's sure to garner adult fans as well as teen fans. And how I loved the characters! I was surprised by how attached I was to the characters since the narration is a bit removed from their actions. There's not a lot of dialog. The narrator of the story definitely has a voice, but you don't get strong voices from the characters, so my attachment to these characters really snuck up on me. Let me just say that at one point near the end of the book, something happens that made me so happy and relieved that I literally just sat there for a few minutes with tears running down my face. I had no idea I loved these characters that much. Somehow, even though a lot of fairly outlandish things happen in this book, I feel like all the events in the story were real. Holly Sloan wove me a tale and I'm buying what she's selling. The books I can think to compare it with are middle grade and I think I'll Be There is for a slightly older audience. As I was reading, I kept thinking about Kathi Appelt's books like The Underneath and Keeper. The storytelling style felt kind of similar to hers or maybe it evoked the same feelings - either way, it's meant as a compliment! As I'm writing this review, I find that I'm also thinking of Barbara O'Connor's Greetings from Nowhere. One last thing is a note on the cover. I read an ARC that did not have a cover image and I was very pleased to see this one when I started to write my review. From the colors used to that endless expanse of stars and nature, I think it evokes the feel of the book perfectly. The cover adds to its crossover appeal and I could easily see this on adult shelves as well as teen. Holly Goldberg Sloan has written for movies previously and this is her debut novel. 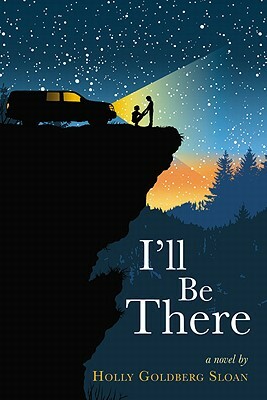 I'll Be There will be on shelves May 3!